For campers, all it takes to have an unforgettable vacation is a tent and a sleeping bag, but this has started to change as more and more people choose to rent mobile homes. When one mentions camping in nature, most people will associate it with a tent and a sleeping bag, or a camper parked under a tree. However, campsites have moved from the traditional forms of camping and in their effort to enrich their offer, many now provide accommodation in mobile homes that are located on the camping pitches and are a great opportunity to spend a perfect family vacation in nature. Camping will always be a form of free vacation, exploring the nature and getting away from the regular holiday resorts. Of course, staying in a tent is definitely the basis of camping, but new opportunities of accommodation in campsites are always welcome. Croatia has been improving its holiday offer in many aspects, and camping is one of them as well. A satisfied guest who has a great experience of vacation on the Adriatic coast and its islands is a primary goal and enriching the accommodation offer is one way to achieve it. Therefore, many campsites in Dalmatia have decided to make the camping experience better by broadening their offer with mobile homes. So apart from the traditional tent and camper accommodation on a pitch, one can now choose a mobile home for family vacation almost everywhere in Croatia. Mobile homes offer all the amenities one need for a great holiday, they have air-conditioning, free wi-fi, bedrooms with comfortable beds, and very own kitchen and bathroom while all the other camp facilities are available as well. While mobile homes provide comfortable accommodation, they also give great sense of privacy, as most of them come with two bedrooms so families can have a room for children and a room for parents. They are also situated on a larger lot, with its own terrace so there is enough free space around a home to enjoy. With all the benefits of a regular apartment, they provide its guests with peace and quiet, which is not often the case when staying in a house with several apartments or in a hotel with dozens of rooms, sometimes not so close to the sea or beaches. 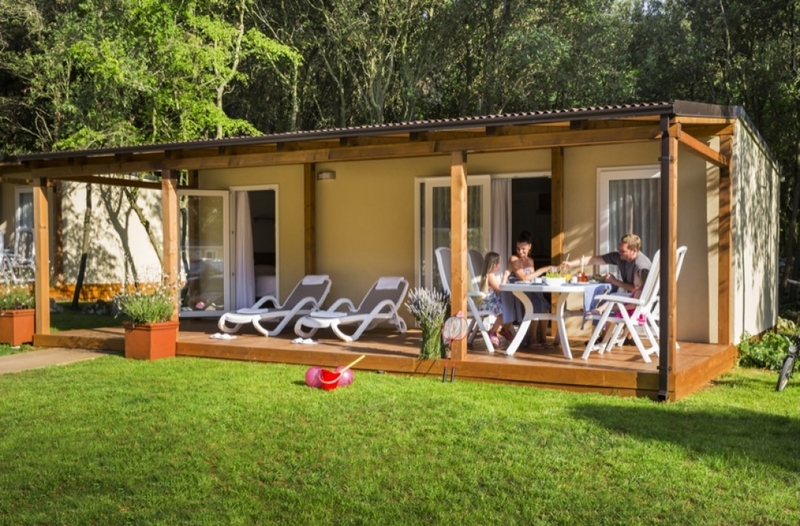 The location of these mobile homes is the same as of any pitch in a camp, which means that if you choose one for your vacation, you will still be in nature, near beaches and among the trees, fully enjoying the beautiful Mediterranean vegetation and Adriatic sea with all the activities as usual. Many camps also offer great camping deals with the best price so renting a mobile home is still affordable and not a great expense for your budget. Staying at mobile homes in campsites gives its visitors the best of both worlds: enjoying vacation in wonderful unspoiled nature near beautiful beaches with all the benefits of comfortable apartments, which means having your very own terrace, a bathroom and a fully equipped kitchen at a pretty affordable price, and it is a new experience of camping in Croatia. It's a nice idea to consider for your next holiday, isn't it? Maybe even this summer.